The Killing Joke was ground-breaking stuff at DC, becoming one of the most influential Batman stories of all time. 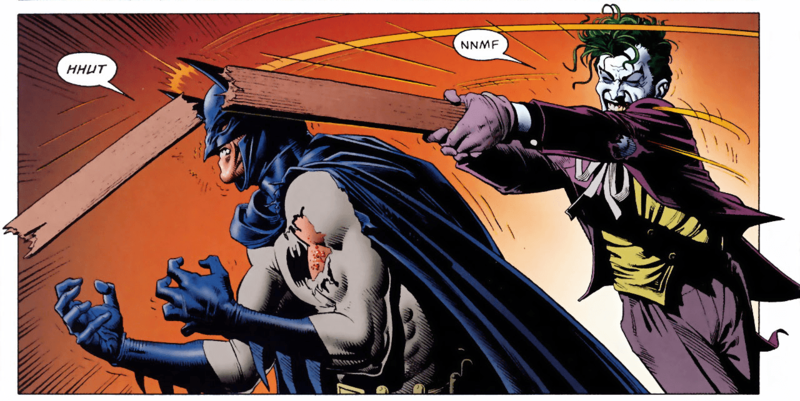 Beautifully drawn by Brian Bolland, Alan Moore highlighted the duality between Batman and his arch-nemesis The Joker as forces of order and chaos, constantly fighting a war that will never be resolved. I’m a fan of Alan Moore. Okay, so what comic book reader isn’t? Actually, I’m sure that there are lots of comic book readers who aren’t fans, but they’re probably living under rocks, inside protective bubbles or residing in the state known as Ignorance. Even if you’re not a fan though, you have to admit that he changed the landscape of comics in a way that few others have. He’s consistently upset the status quo of how comic book stories should be told, and his writing is never predictable. Collaborating with some of the finest artists in the business who translate his words into form, the odds are good that if a comic has his name on the cover it’s going to be something special. I have a friend who said he read Watchmen in a day and totally understood it. I know that he’s wrong. The first time that I read that it took me a week to absorb it in a way that made sense to me, and then I went straight back and read it again, discovering that I’d missed so much. Some have now chosen to describe it as over-hyped, and I can see where they’re coming from, but it’s still an astonishing piece of work. It’s been well over 20 years, and I’m still discovering new things in Watchmen that I missed and debate about it with others. It’s the gift that keeps on giving and that’s the joy with Alan Moore’s work: it’s layered but flows naturally. 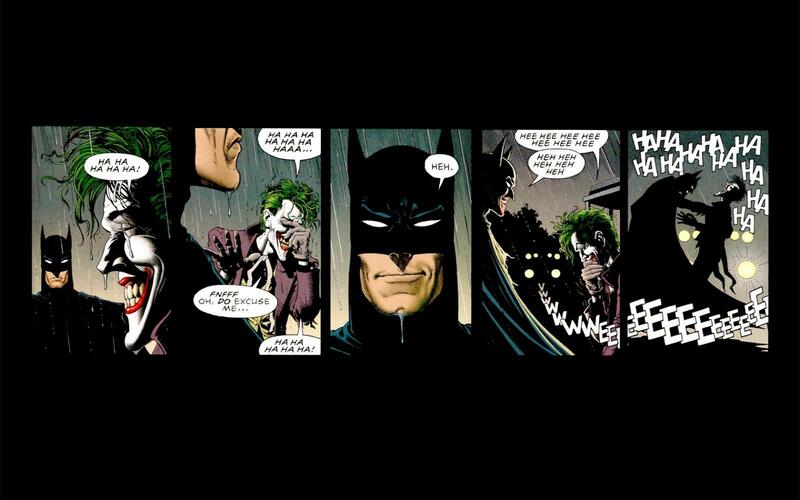 Then there’s Batman: The Killing Joke. It gave us the definitive Joker origin, although played with the idea that the origin presented may be false anyway. It inspired Tim Burton’s Batman films, Heath Ledger’s performance of The Joker, and was more shocking than anything that had been on offer before. The Killing Joke is also the story where Barbara Gordon was shot, paralysing her and ending her career as Batgirl. Afterwards, in comics she became Oracle, fighting crime from her wheelchair as a computer hacker and information gatherer. In this role, Barbara Gordon became one of the most respected characters in comics and proved that heroes can come in all forms, that true strength isn’t determined by muscles and brute force but by heart and determination. In her own way, she became a pivotal member of the Justice League and went on to affect the whole DC Universe… but it all started with The Killing Joke. Despite all of this, Alan Moore has been critical of it over the years because he argues that it’s still just a story about Batman and The Joker, even if it’s one that’s a little bit better than some of the others. He’s right, of course; those who think this is a turning point for Barbara Gordon are both right and wrong: this isn’t Barbara’s story at all, and there seemed to be no plans for her future. Barbara was shot and violated as little more than a plot device, and there’s been a lot of debate over the years about the whole incident being yet another example of how disposable women characters are. Moore’s decision to paralyse her led to a moment that was shocking to the readers, so it worked for the story, but he’s also gone on record as regretting his choice as shallow and ill-conceived. If you think what he did was harsh and disrespectful, check out his comment about what the editors at DC said when he asked if they were okay with it and they’ll make you feel ill. To say they didn’t seem to mind is an understatement. 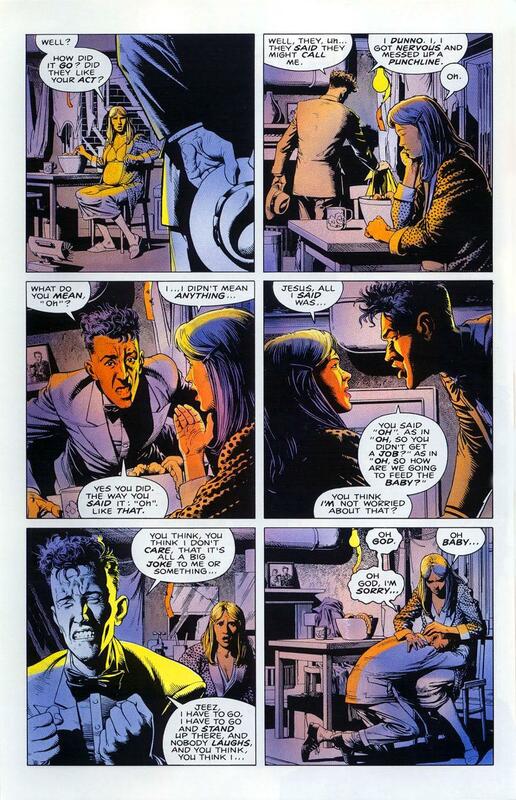 It was a far cry from Stan Lee’s apparent disapproval of the death of Gwen Stacey, and it took Kim Yale and John Ostrander to give Barbara Gordon a future beyond The Killing Joke. 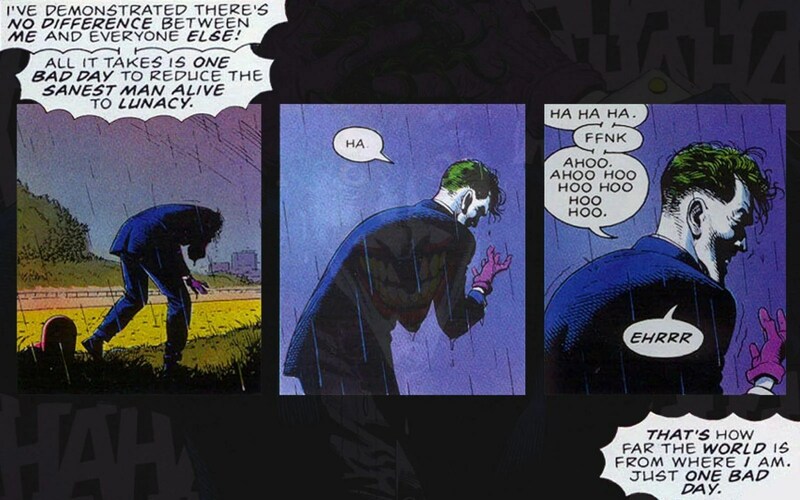 There’s nothing funny about the story in The Killing Joke… except maybe for the last couple of pages when The Joker cracks a gag that’s so bad it makes Batman laugh, bringing the story to an odd conclusion given all that’s happened up to that point. We see the (possible) tragedy that made The Joker who he is, Barbara gets shot, Commissioner Gordon gets kidnapped, stripped, humiliated and pushed to the brink of insanity and, after a quick scrap, Batman takes time for a giggle. It’s a great story, just not a funny one. What is funny, in a darkly hilarious way, is how it’s become such an iconic tale over the years in spite of itself. It wasn’t the origin of Oracle, Alan Moore isn’t that proud of it, Brian Bolland wasn’t satisfied either (and has pointed out that it was his project originally anyway, not Moore’s), and it’s gone on to trigger more debate amongst creators and fans than almost any other comic out there. But it sold well and is almost essential for fans. Like those last couple of pages, it’s a bad joke that’s funny because it’s bad. Maybe Moore is right, it’s just another Batman vs. Joker story. It just happens to be one that’s better than others.